Doing research on how Native Americans used pumpkin to find interesting recipes made me wonder. 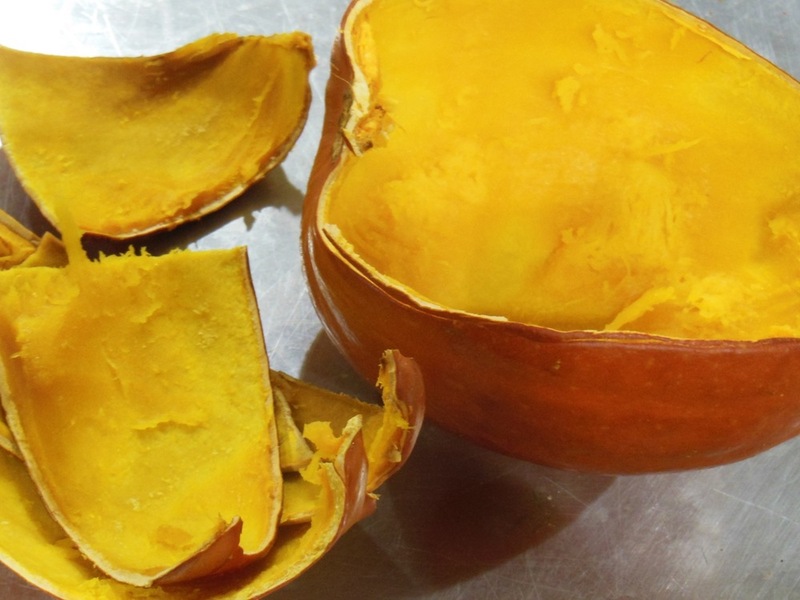 How hard could a pumpkin shell become so that it could be used as a serving dish and seed storage? According to my research, pumpkins may have saved early North America European settlers. Struggling after their first landings on the east coast and not prepared for harsh New England weather, Native American Indians taught European settlers basic gardening, hunting and cooking skills. One of the staples of their diet was pumpkin, a squash that was native to the ancient Americas. Sweet pumpkin flesh was roasted, baked, parched, boiled and dried. Pumpkin seeds were roasted; at times also used as medicine. Blossoms were added to stews. Dried pumpkin was stored and ground into flour. Strips of dried pumpkin were woven into mats, cups and baskets for trade. I baked a pumpkin to get the inside ready to make a pie and was intrigued. Pumpkin shells, once baked, become quite hard and impermeable, reminding me of a plant "leather." Picking up the baked pumpkin, it was easy to imagine how it became an important part of their kitchen. It even holds water! Pilgrims had another use. According to New England colleagues, hey used pumpkins as guides for haircuts, which gave them the nickname "pumpkinheads." Can't you just see someone sitting on a stool getting a haircut with a sliced pumpkin on their head? ?